Size of Babe: officially huge. He tipped the scales at 4 full pounds at our growth ultrasound. The apps say he should be 3.2lbs and the size of a small coconut. To add insult to injury, Gray's head measures in the 90th percentile (he gets it from his daddy). And finally, because my son loves me so much, he is completely and totally breach. Looking back, he's been breach for most likely the last few weeks and was definitely breach in Greece. We kept poking at the hard part just under my bra line saying things like "what is that?!" and then making educated guesses like "a foot". All of those things combined have now lead this pregnancy to be labeled "a funky little third trimester" by my OBGYN team. Typically, we would assume the babe would get the memo and would flip himself but sadly his giant head may actually prevent him from being able to make the turn. Trust me, I'm pretty sure he's trying based on the massive head slams into my diaphragm. At this point we won't move my due date but instead need to wait and see if he's able to flip himself. If not, we will then evaluate his head size and determine if attempting to turn him is even worth it....because his giant head may not come out the regular way anyway. Ouch. If he can turn himself and his head seems doable (uh, what?) then we'll most likely be good candidates for early induction thanks to his extreme chunkiness. Symptoms: well, now that we know he's breach, we can attribute most of my extreme aches and pains to all of the physical activity in Greece and his position. Because his rump and legs are down in my pelvis or stretched across it, I'm feeling very intense muscles pains in my lower abdomen that get worse as the day goes on or if I change positions. I won't lie, his head at the top or my abdomen is very uncomfortable and not exactly pleasing to the eye. Surprisingly, my excessive swelling can also be attributed to his breach position and is now being monitored. As it turns out, breach + third trimester = exhaustion. Last night I fell asleep at 6:30 and slept in my clothes until 9am this morning. Loving: all of the projects I've completed in the nursery in the last 2 days. Most are just waiting for Justin's final touch and then the nursery will be complete! Loathing: our crazy house. Suitcases everywhere, laundry piled up, our new runners still not here yet....it's very rogue. Husband: is back to work. I'll only see him at the dinner table until the baby is born. Best Part of the Week: seeing his little face! He has fat cheeks, his eyes are open, he's practicing his breathing and he has hair. He's healthy and happy and taking up every inch of space that he has. capable of because this is your first baby. You'd be surprised how much a pelvis can take!" Uh, no. Can't wait for: our One Year Anniversary date night this weekend...and a Lady Date! Even if you can't squeeze his head out au natural, I had both my babies via C-Section and don't regret it for a second! Either way you deliver, it's the end result that matters right? Hang in there mama! Looking great girlfriend!! 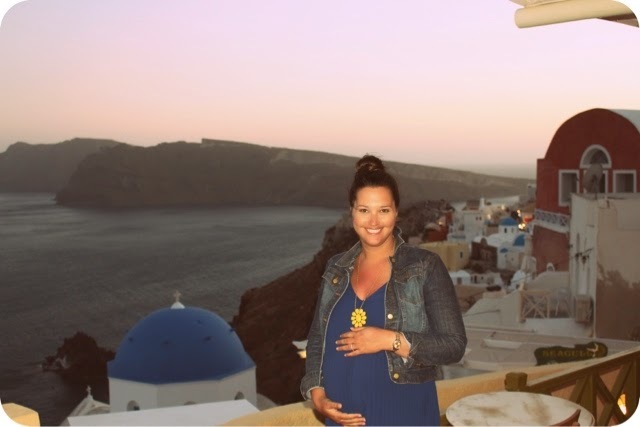 As beautiful and amazing as Greece is, you were a trooper for exploring at 31 weeks preggo!! Oh girl!! You poor thing! My sister in law had her baby on Mother's Day, 45 hours of labor and they had to do an emergency C Section. Turns out the little lady was 9 lbs. and just couldn't take the normal exit route. Happily mama and baby are doing great. Hope you're little man turns around - at what point in the pregnancy are they supposed to flip? I only ever feel her kicks down really low never up high.